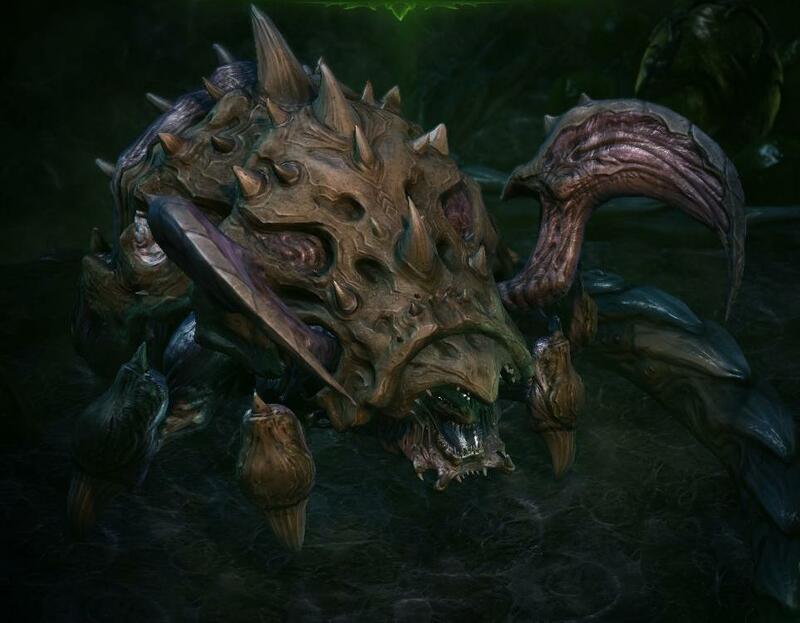 Horse-sized “heavy assault” Zerg who spit short-range jets of acid – generally incapable of directly harming a battlesuited soldier or military vehicle, but corroding and weakening armor, making them vulnerable to other breeds in the swarm. Traits: Zerg; Enhanced Move 1 (Ground); Regeneration (1 HP/min; Only When Burrowed); Extra Legs (4 Legs); No Fine Manipulators. • “Corpser Strain” – Any living being of Size 0 or larger killed by a Corpser Roach is implanted with eggs, which quickly devour the victim's bio-mass and hatch in 1d turns into two Roachlings (use Zergling stats). Roachings are unstable, and live for only 2d minutes. • “Vile Strain” – Add Follow-up to Acid Spray: Roll HT-3 or DX -2, Basic Speed -2.00).